Okay, you know as well as I do that there’s sore throats and then there’s SORE THROATS. (Yes, I’m yelling!) 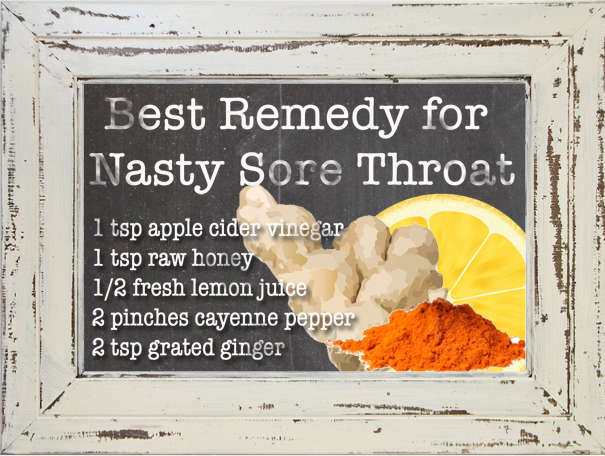 So if you have a nice little sore throat a cup of hot water or a good gargle can cure you, but if you have a SORE THROAT than Healing a Nasty Sore Throat can be much more difficult. This is the ultimate all time most effective remedy for sore throats. Make it and take it at least 4-6 x a day or until symptoms get better! Okay, so if you aren’t brave enough to try the above recipes here’s some good advice in order of effectiveness from other readers. (obviously see a doctor if you feel it is necessary). Cayenne Pepper- A pinch of cayenne pepper in a cup of warm water or honey every hour. Apple Cider Vinegar- a tsp of apple cider vinegar mixed with honey or water every hour. Oil of Oregano- 4 drops of oil of oregano in a cup of warm water.